Captain James Josiah, Charles Wilson Peale, 1787, Antiques and Fine Art Magazine. The Continental Navy was quickly overshadowed by the resounding success of privateers during the American Revolutionary War. 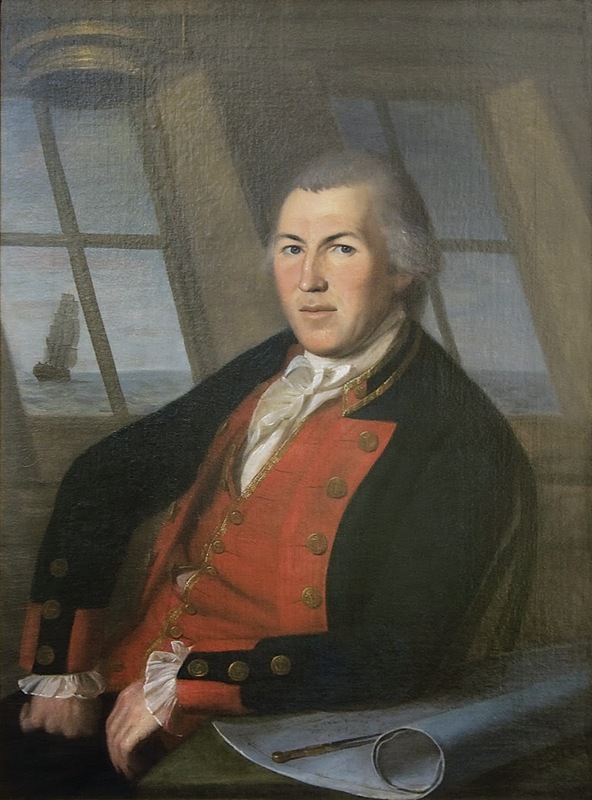 James Josiah partook in that success with his sloop Washington, after a time as a lieutenant and later captain in the Continental Navy. During his service, Josiah was captured by the British and horribly mistreated aboard the frigate Cerberus, giving him a thirst for revenge that motivated both his naval and privateering careers. This painting was done well after Josiah's service in the war. He is bound away for China in 1787, and poses in the cabin of his merchant brig St. Croix Packet. Still, he chose to be portrayed in his Continental Navy uniform, a sign of his pride in the service. Josiah's coat has a short standing collar lined with gold, and fitted with a small button on a red field. This matches the hue of his gold piped waistcoat, as well as the facings of his coat. The wide buttons on his plain lapels are evenly spaced and without lace. At his neck is a white cravat which appears to match the delicate material that makes up his frilled shirt cuffs. A final touch befitting any captain are the scalloped mariner's cuffs that reach over the red cuffs of his coat sleeves.